Nokia Lumia 900 released on CES 2012 is remarked as the most anticipating product recently, and now with the news that the upgraded version Nokia Lumia 910 equipped with 12-million-pixel camera is going to make a debut, the popularity of this mobile phone has been improved largely. According to the foreign reporters, online mobile retailer Typhone.nl from Dutch has presented the promotional shot of Nokia Lumia 910. Among the main functions introduced, the 12-million-pixel camera is the most shinning one. 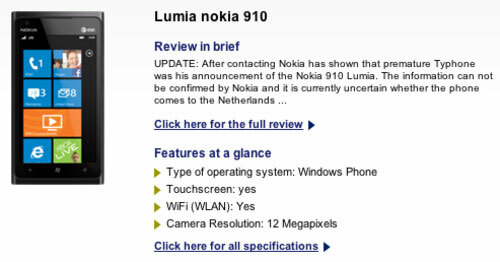 Statement from this website also indicated that Nokia Lumia 910 will be put into the market for sale in the following several months. It will continue to adopt the appearance of Lumia 800 and most hardware configurations will be the same with it. But Nokia official has not responded to this matter until now. It remains unknown that whether it will be Nokia Lumia 910 with 12-million-pixel camera or an international version of Lumia 900 will come into being. And besides the improvement on camera pixel, are there any other changes in specification? And may be the answer will be unveiled on the upcoming MWC 2012. Although no more details about this phone have been exposed, we still expect it will bring us with another mythology in the development of Nokia. With the released Lumia 900 we can enjoy more in our digital life: movie enjoying, music listening and picture appreciating, and we believe that Nokia Lumia will add more fun to our digital life. Here a small tip should be reminded is that when you are trying to transfer video resources to Nokia Lumia, you have to do video conversion, for simple video conversion, an all-powerful video converter can do you a favor, for DVD/Blu-ray video conversion, a smart Blu-ray ripper will do the job for you. Focus on this blog to get more technology news on mobile phone, tablet PC, digital camera, DV, and more. And the latest information Lumia 910 will follow as well.